Hi everyone! I want to say Happy Easter, but if we were talking thousands of years ago, in a pre-Christian era, the greeting might be more like, Happy Equinox, with a pagan smile or Happy Innana Resurrection Day, with a Sumerian inflection. 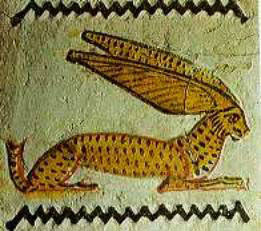 Or maybe, Happy Wenut, forever live her Glory, with an Egyptian twang. Or, drawing on a popular neo-pagan deity, Happy Ostara? 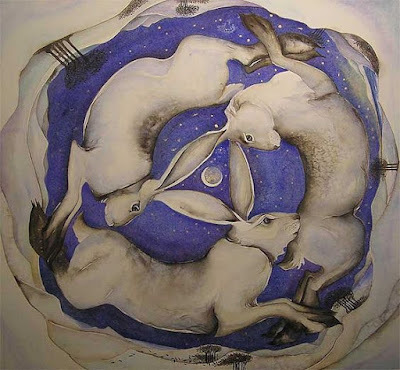 There's no arguing that the rabbit is linked to the Christian tradition of Easter, but other than the mysterious triple hare symbol (seen above), there doesn't seem to be any connection prior to a few hundred years ago. There are recent claims that Ostara, goddess of the dawn (eastern) light, took on the form of a rabbit and is associated with hares and eggs. It's not authenticated. The only ref to Ostara (Eostre) is from the Venerable Bede in his work The Reckoning of Time where he talked about calendar months. All Bede said was that the pre-Christian celebration of “Easter” is predated by “Eostre” (another version of the name Ostara) who resided over the entire month of April. 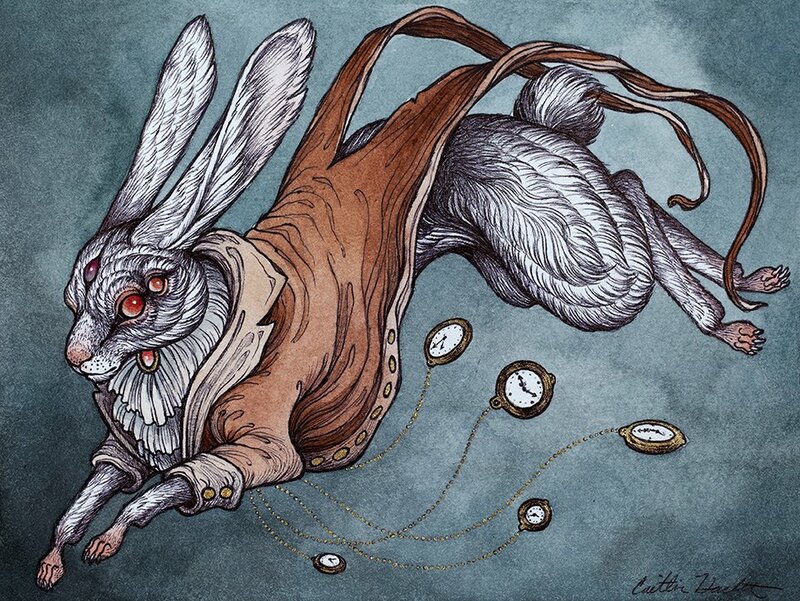 The rabbit may be a new addition to the accoutrement of Easter, but the symbolism is important - fertility, virgin births (rabbits can store sperm, birthing a litter long after the male is gone, which can seem miraculous) the season of Spring, abundance, renewal, wit, survival and my favourite - the Trickster. The Trickster is an archetypal figure found in all cultures, in all places, in all times. She, or he, is both unconscious and super-conscious, hidden in our awareness and projected out into the world. 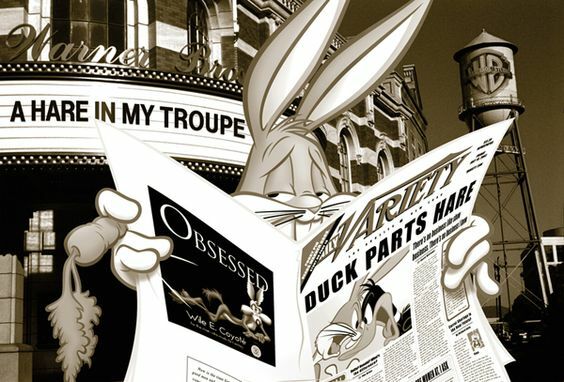 And, sometimes that projection takes the form of a rabbit. 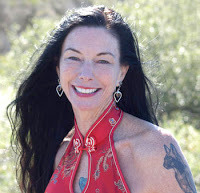 The Trickster comes along when we are stuck, either in a habit pattern that no longer serves us, a limiting thought about ourselves or others, or a feeling of being trapped or out of touch with the creative life force. When we get into such a state, the Trickster comes to blow the roof off the house, shaking our core, facilitating change. We fall in love, or make a radical decision, or have a sudden shattering to restore the flow of energy to our hearts. We see the rabbit as trickster in literature, from the great rabbit in Watership Down, to Re're Rabbit in the West African rooted tale, from the White Rabbit in Lewis Carroll's Alice's Adventures in Wonderland to the resurrected Velveteen Rabbit. Something to think about as you bite off a choc-bunny head. Hey, maybe even something to laugh about. 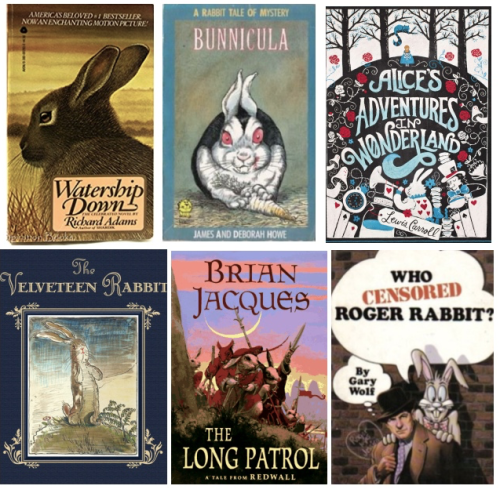 Let me know your favourite rabbit in literature. After all, the Trickster is afoot! 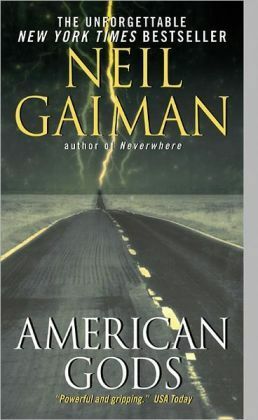 The things I carry with me: American Gods by Neil Gaiman. So many things to say about this one. I think I read American Gods in college and it changed what I thought about everything. Screw Philosophy 101, I had my own new textbook about what was meaningful and what was not. American Gods is about Shadow Moon who falls into the employment of Mr. Wednesday who is on a cross-country quest to unify the Old Gods against the New Gods that American's have created: Media, Technology, and everything else that American's sacrifice themselves to. And then there was Neil Gaiman himself. A British author who had managed to capture the problem with the American condition. He is a hard-core feminist, someone who animately believes that dragons can be beaten, and an author who crossed genres with little more than the bat of an eye. If you've seen the new Lucifer series on FOX, that's a brain child of Gaiman. If you remember Coraline, that made buttons scary for me, that was Gaiman as well. So what exactly do I carry with me from this extremely influential author and this paramount of a book? 1). That we determine what we worship and what we expend our energies on. The most powerful part of American Gods is that people created the gods based on what they sacrificed their time, blood, sweat, and virgins to. The power is really within people, the gods take it and live off it with very little in return. I carry with me the notion that I choose what I deem sacred. I choose what I spend my time on, no one else. 2). World-building doesn't have to be middle earth. 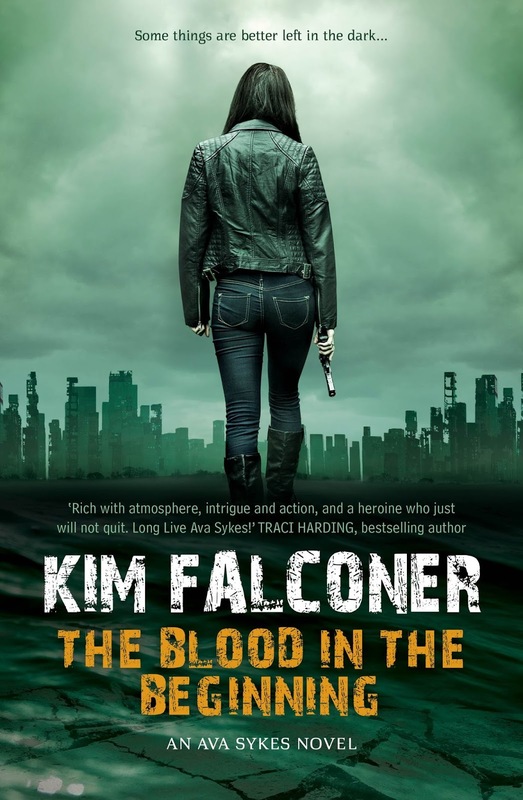 As Kim Falconer talked about here, World Building is just as important to your story as who is in the plot. 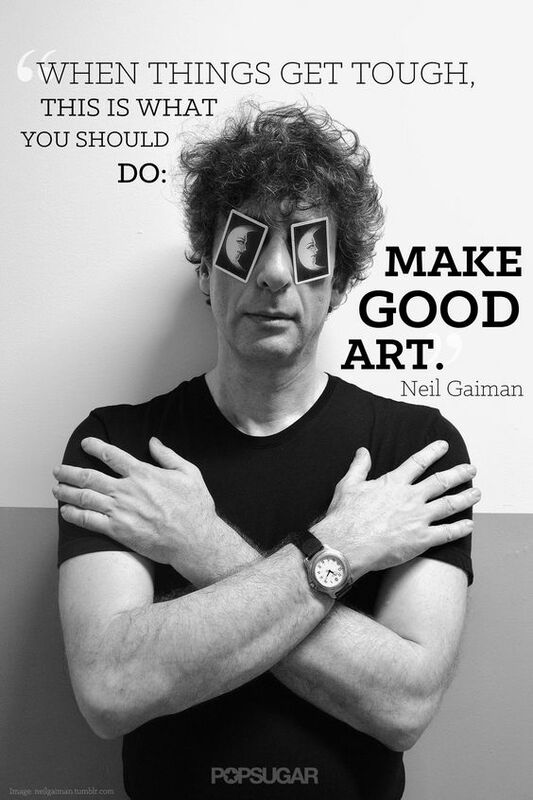 Gaiman was an inspiration that Magic could be found in everyday life with normal humans knowing nothing about it. World building was research into the normal horrors that could be magical, as well as strange things that could have a double story. 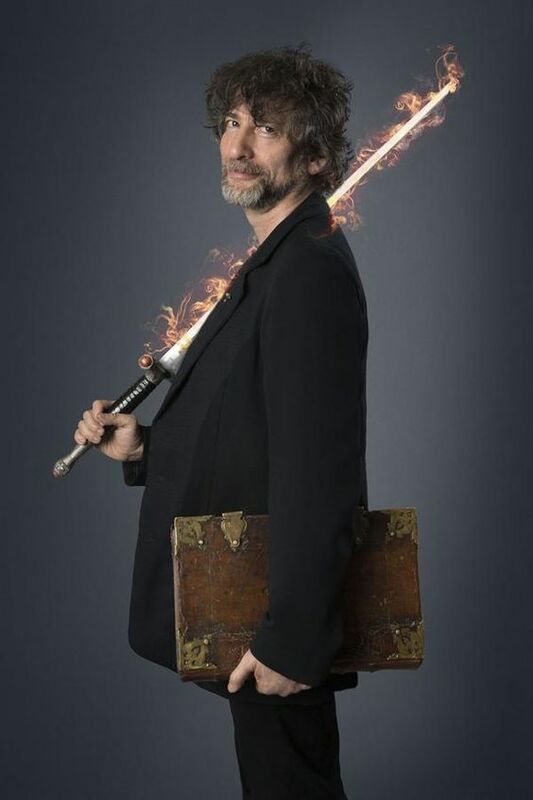 Its pretty much the philosophy behind Urban Fantasy, only Gaiman took it to a national level and not just a city. 3). When things get bad, make art. When things are good, make art. Art can change, can be used to make the world better. It seems like more and more, we need to fight for what we believe in and Art is a powerful force to make out point. So, in case you didn't know, STARZ is making a miniseries of American Gods starting on April 30th. I am very nervous about this as this book is a fundamental part of who I am and what I do. So hopefully next month, I will be able to report that its natural wonder was not stripped away, but that it faithfully imparts the lessons that the book did. Daughter Of Blood: Meet The Characters! Because both the series' main character (Malian) and the title character of the book (Myr) are women—and there are also a large number of other important women characters in the WALL story—penning Monday's post got me thinking about the particular ingredients that characterize the Fantasy genre's heroines. Usually, with SFF, there’s a “quest” or problem to be resolved, which the heroine usually either finds by curiosity or accident or which finds her, either willingly or unwillingly. Karou in Laini Taylor's Daughter of Smoke and Bone and Ava Sykes in Kim Falconer's The Blood in the Beginning fit the former scenario. Malian and Myr from Daughter of Blood both exemplify the latter; and Shallan in Brandon Sanderson's Stormlight Archive series is another good example. One of the factors Fantasy heroines often have in common, whether dealing with the stuff of everyday life or the fate of worlds, is resolution in the face of difficulty, particularly in withstanding adverse circumstances but also in seeking for solutions. 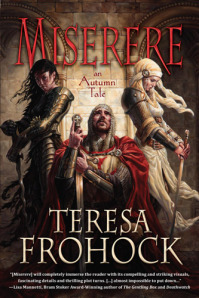 All the heroines mentioned above share this quality, but Rachael Boucher in Teresa Frohock's Miserere and Teia of Elspeth Cooper's Wild Hunt series are also strong examples. In order to be a heroine, too, the circumstances the character is dealing with must involve an element of grave risk, possibly even death—she must be called upon above and beyond the demands of simply being a good citizen. 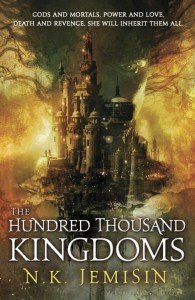 Yeine Darr, in NK Jemisin's The Hundred Thousand Kingdoms, is in no doubt that her own life and that of her country rests on her ability to overcome the dynastic and divine politics of the Kingdoms. Malian of Night, too, is faced with choices that affect the lives and wellbeing of others and her own life is very much on the line. I would also argue that to be a heroine, as opposed to an anti-heroine, the character must have some concern about choices between right and wrong, either at a personal or societal level, or both. Karou fits this bill at both levels, while a character like Mercy Thompson, from Patricia Briggs' paranormal urban Fantasy series, is more focused at the personal—hometown and community—level. My own character, Malian, while not unconcerned with personal considerations of right and wrong, is far more focused at the wider societal level. I also believe that the possibility/potential for self-sacrifice is tied to what it means to be a heroine—a natural extension of both risk and considerations of right and/or wrong action. In the final analysis, too, I feel that to be a great heroine, we as readers have to feel empathy for the character’s tribulations and choices. This may not be as straightforward as liking the character but we have to be emotionally engaged with the path she’s walking. Of course, you may also point out that this is true for what makes a heroine in real life as well—and I can’t argue with that. But what do you think? Are there other qualities you feel are essential to make a character a great heroine, either in Fantasy or other fiction?